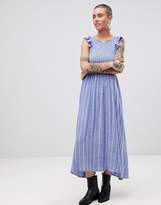 Midi dress by Free People, Some serious daytime inspiration right here, Round neck, Shirred top, Ruffle sleeves, For the frill of it, Midi length, Loose fit - drapes softly over the body. With roots back to the '70s, the Free People girl lives through art, fashion, music and wanderlust. She's feminine in spirit and Bohemian in attitude. From sweet to tough, tomboy to romantic, Free People mishmash colour and prints across an inspired collection of free-flowing maxi dresses, super-soft jersey and leather ankle boots.